The records fell again this morning as Ian Hutchinson rode to victory on his Honda CBR600. Hutchinson took the lead from New Zealander Bruce Anstey in dramatic fashion after the lap two pitstops when Anstey's GSX-R600 failed to restart immediately. Anstey had been leading from John McGuinness with Hutchinson third looking like a repeat of yesterday's superstock race. HM Plant rider, Hutchinson, took the race record, knocking 34.62 off the record to complete the four lap 37.73 mile race in 1hour 13min 28.11sec. After the race Hutchinson said: "Wow! The first two laps I saw P3 and thought 'what is it with P3 I could at least get a second. "I'm over the moon. HM PLant have given me a chance and I'm just glad I have got my fitness back. I can't believe it." John McGuinness took another second and his third podium in as many days. He rode a solid race and stayed second throughout. He said: "I really enjoyed the race. I tried my best from the start and had some good runs over the mountain. Hutchinson deserves it but I had a really bad run past some of the slower riders and got held up." third place Guy Martin is now the lap holder after McGuinness, Anstey and then himself went faster on the final lap. He recorded a 125.161 and he said: "It's good but I have not won 'owt by it. I didn't think I could ride the old girl (his Honda 600) any harder." Hutchinson leads by 6.65sec at the Ramsey Hairpin from McGuinness. Martin is 8.48ses behind the leader while Anstey is 10.88secs down. At the Sulby speedtrao Hutchinson is fastest again, matching his lap three speed of 169.900. Anstey is faster again at 166.900 compared to lap three's speed of 166.500. By Glen Helen Hutchinson leads by 5.80secs from McGuinness. Martin is third with Anstey fourth now 11.38secs down on the leader. Parrett has retired at Quarterbridge. BSB's Steve Plater moves up to 9th after the retirement of Parrett. Top 10 after lap 3: Hutchinson, McGuinness, Martin, Anstey, Parrett, Farquhar, Beattie, Cummins, Palmer, Lougher (Parrett's time penalty not yet added). McGuinness leads on the road but Hutchinson is still in the overall lead on time after a 18:48.58 (120.353mph) lap. McGuinness is now 5.04secs behind on time. Anstey has pulled back two seconds already heading to Ramsey Hairpin. Hutchinson now leads McGuinness by 2.17secs with Martin in third. Hutchinson is the fastest man past the Sulby Speedtrap again at 169.900. Anstey is now a man on a mission as he tries to make up the lost time at 166.500, faster than his previous two laps. Ian Hutchinson leads by 0.39sec going into Glen Helen ahead of McGuinness. Anstey is fourth behind Guy Martin after his pit stop nightmare 12.24secs down on the leader. Top 10 after lap 2: Anstey, McGuinness, Hutchinson, Martin, Farquhar, Parrett, Beattie, Cummins, Palmer, Lougher. Drama in the pits as Anstey's Suzuki GSX-R600 fails to restart. He gets it going half way down the pit lane after a push start. He has lost 23 seconds between the Bungalow and the pits. Parrett received a 10sec stop-box penalty. Leader Anstey breaks the lap record again at 125.041mph (18.06.27) just after McGuinness had broken it with a 124.763. Ryan Farquhar and McGuinness fly through Ramsey Hairpin together as Kiwi Anstey extends his lead to 7.39secs from McGuinness. Hutchinson reclaims third. Manx men Conoer Cummins and Chris Palmer are eighth and ninth respectively. 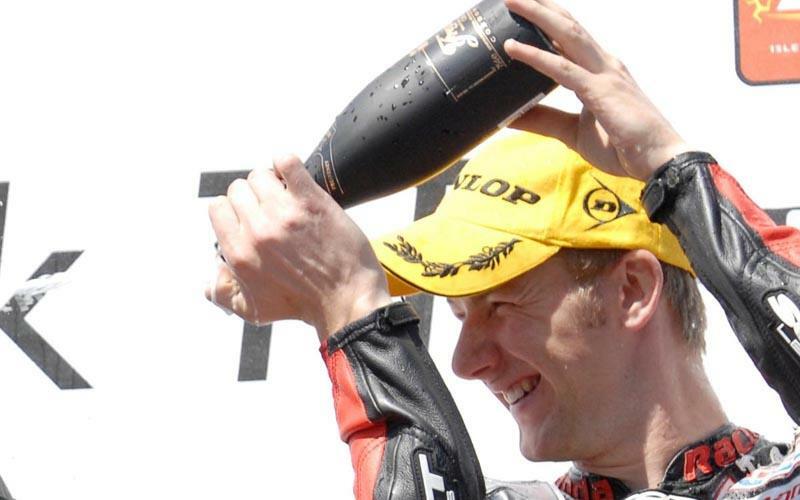 Hutchinson matches his lap one fastest time past the Sulby Speedtrap to record another 168.600mph. Beattie is the second fastest at 167.800mph while leader Anstey travels at 165.700mph. Anstey extends his lead again to 4.73secs ahead of McGuinness. Michael Rutter retires at Crosby Hotel. Top 10 after lap 1: Anstey, McGuinness, Martin, Hutchinson, Beattie, Farquhar, Parrett, Cummins, Lougher, Palmer. Michael Dunlop, son of Joey, retires from the race at Ramsey. Anstey carried on his form from yesterday as he breaks the lap record of 18:15.61 set by John McGuinness last year. Anstey's lap took 18:14.90 at a speed of 124.055mph. McGuinness is second with a 18:16.98 and 123.820mph. Bruce Anstey extends his lead to 3.14secs ahead of McGuinness at Ramsey hairpin. Nigel eattie moves in to fifth palce on times while Guy Martin climbs to third ahead of Hutchinson on time. Ian Hutchinson is the fastest man at the Sulby Speedtrap at 168.600 on his Honda CBR600. Bruce Anstey leads the race giong to Glen Helen on lap one from John McGuinness and Ian Hutchinson. Murray Walker gets the race started with Ryan Farquhar the first to start the race.